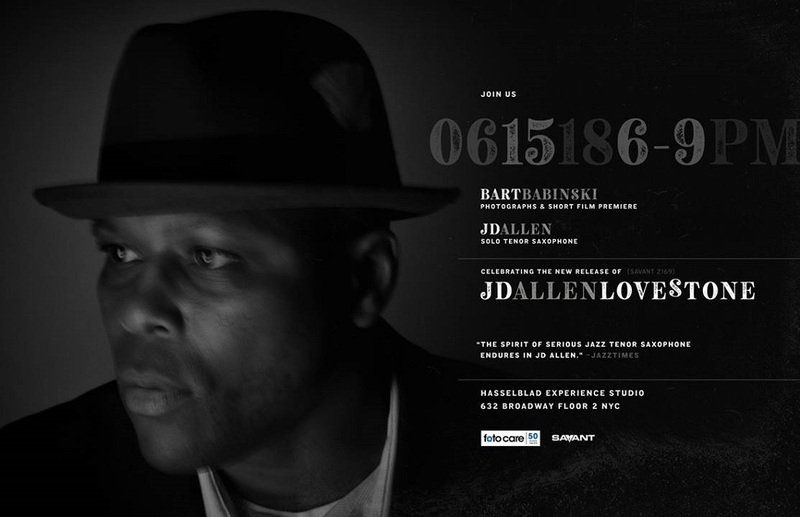 Please join us for this very special evening on June 15th from 6-9pm at the new Hasselblad Experience Studio to celebrate the release of JD’s stunning collection of ballads, LOVE STONE along with the photographs and short film that were shot along with these siren songs, hitting the streets the morning of June 15 on Savant/High Records. Collector’s photos and CDs will be for sale with part of the proceeds going to help fuel the dreams of future photographers and musicians around the world; both charities of the artists and photographers choice will be announced ahead of the evening. Come and celebrate with us for a few nights kicking off at Hasselblad in NOHO with JDs gorgeous solo saxophone, short film/slide show premiere, collection of photos by photographer Bart Babinski, Love Stone CDs, light snacks, summer drinks, good vibes + good company on release day and then again on Monday, June 18th when LPR presents at NuBlu 151 two sets with the JD ALLEN TRIO featuring Gregg August & Rudy Royston.